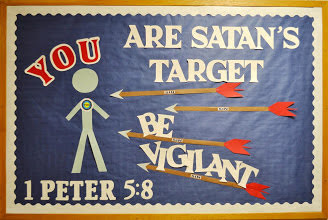 Bible Fun For Kids: Satan's Target Bulletin Board and More! 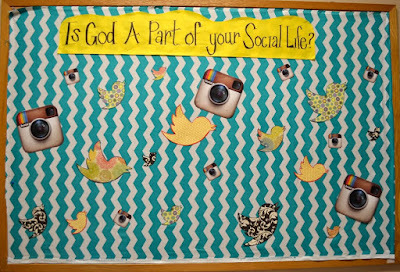 I thought up this bulletin board and intended to add some real arrows, but I ran out of room! 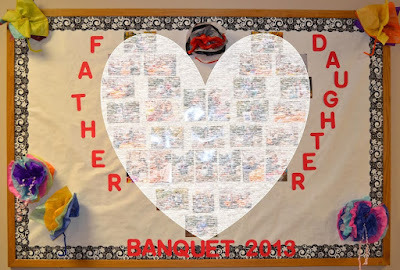 I used a 4' x 8' bulletin board for over 25 years, and it is hard to get used to making smaller bulletin boards. For some reason, this didn't want to fit and I had to keep moving the letters around. Anyway, I used the Junior font from the Cricut Extreme Fonts cartridge. They are 5" and the scripture is 4 1/2". Also, the red in my printer is not working (new printer, new ink cartridges, so I don't know why), so I printed one arrow in grayscale for a pattern and cut them out on colored cardstock. You can print the person, arrows and target here. 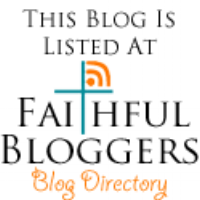 I have a couple of ideas for bulletin boards for you. These were done by others at my church building. Photos are used with permission. 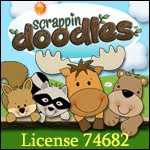 And, they are posted in the order that I received permission. The above Social Life is by Jen Farmer. I love the fabric for the background and the different patterns for the birds really gives the whole board texture! 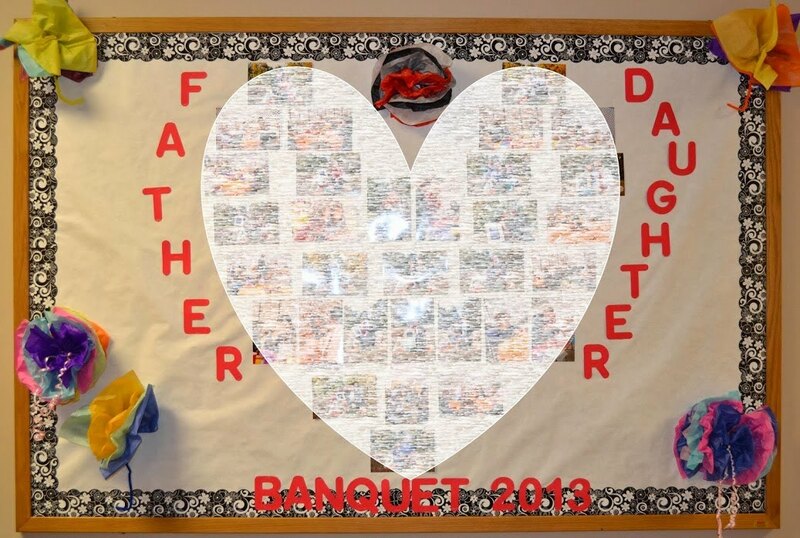 This bulletin board for the Father Daughter Banquet was mostly done by Deanna Hutson and her Mom Dana helped. 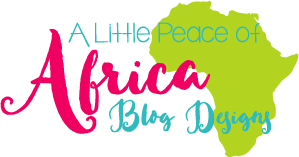 The ideas and the pictures shaped into a heart are what Deanna envisioned. Sorry, I had to mess it up by adding the heart on top of the pictures, but I don't have permission to add everyone's photos. But, you can see how the pictures are laid out on the board to make the heart. And, the puffy tissue paper flowers add a great pop! Thank you, Deanna & Dana! 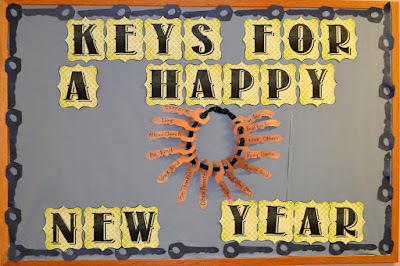 This Keys For a Happy New Year was done by Cathy Ross. I love the keys used as the border! The keys say exercise, time, attend church, be kind, work hard, be thankful, obey parents, serve others, tell others about Jesus, Praise God, pray daily, love others, read your Bible and live for Jesus. Thank you, Cathy! Thanks everyone for allowing me to post your ideas!